Sorry I have been away for a while, but things got weird and I figured I would take the time needed to square everything away. I will be back on June first. Sorry I have been gone for a couple of weeks, but family issues have kept me very busy. I am back now and, hopefully, won’t have to have another absence any time soon. Today I am doing the Dewey’s Read-A-Thon which I have done a few times before. The start time for where I live was 5 am; unfortunately, I wanted to get a little more shut-eye and did not start until 8ish. I am going to just post a lift of the books I read as I finish and will add reviews tomorrow or Monday. I looked through my huge TBR stacks and found a few eclectic, short reads to fill my day. THE TRAIN by DIANE HOLT finished at noon 164 pages. This lovely little book collects quotations from some of the books which might have been in the Beast’s library and adds musings by Belle related to the quote. The books quoted include The Odyssey, Don Quixote, The Canterbury Tales, and others so this is not a book for young children, but for advanced pre-teens to adults. The quotes will bring back memories of classics read and might just make the reader seek out those unread. There is an appendix with a listing of all the books quoted to aid in the discovery of new books to love. The quotes by Belle add to the understanding of the quotes which might be difficult for younger readers. As a lover of Books About Books and Beauty and the Beast I thoroughly enjoyed this book as it is beautifully put together in addition to being a joy to read. The illustrations are gorgeous and there is even an attached silk bookmark. I highly recommend this for bibliophiles and fans of the movie. In the little town of Yellow Springs, Ohio nobody’s personal life is secret, or so it seems. It is therefore a complete surprise when Kristen and her two children go missing after a Saturday girl’s get together. She appeared to live a happy life and was dealing with her impending divorce without issues. Her disappearance begged the question, was her doctor husband what he seemed, or something more sinister? I have been doing pretty well with my Book of the Month selections so far and this title is no different. I usually have mysteries figured out a few chapters in, but this author wove a web of uncertainty which had me guessing until the very end. I would recommend this title for lovers of mystery and suspense. It would also make a great beach read, which isn’t too far away. Well, that’s it. I am finally caught up with my reads from last week. I hope to stay on top this week and should have a new review up tomorrow. I don’t know what I’ve been doing wrong, but last week I was plagued again with migraines. Luckily, they only were on and off so I got some reading done. I am posting the two Hidden Gems books I read and will get caught up on the rest tomorrow, if the migraine gods will let me. When Jennifer Frost moved to Pelican Bay to open her own B&B she thought she was leaving behind the rigors of her old journalist job in the big city. When she finds a neighbor drowned in her pool she doesn’t think it was an accident and then she must find the killer before they go after her. An enjoyable cozy with enough twists and turns to keep you interested, this is a good start to what could be a great new series. When a meteor lands on earth it leaves with it an alien species very dangerous to mankind. I really liked this book until the very end. It has exciting moments and great characters. I just thought the ending was sudden, upsetting, and left much to be desired. I would still recommend this as it is a very short, quick read. Just don’t necessarily expect to like the ending. Hope everyone is having a happy day. I will be back on Monday with reviews of last week. I am currently reading two books and should have reviews up tomorrow. I forgot how much I enjoy reading more than one book at a time. I find I actually read faster as I bounce back and forth and don’t get bored at all. I am into both a sort of children’s book (you’ll see) and my current Book Of The Month Club selection. Went to the movies last night and saw Unsane. If you want to know what I thought check out my film blog. Spoiler alert: It was my least favorite film of the year so far. Hope your Monday is going well and until next time Good Night and Good Reading. In 1899 young Alice is put into a Scarborough mental institution against her will. 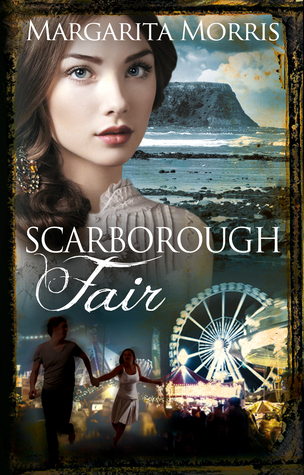 In 2016 Rose goes on a Summer Holiday to visit her grandmother in Scarborough and while there discovers not only a new love, but also a mystery involving her Great, great, grandmother and the woman she works for who mysteriously disappears. Told in alternating times this YA Romance/Historical novel is not only a quick, but at times, an exciting read. With action and mysteries happening in both times the author weaves an intricate tale of poor choices and betrayals which span generations. I would recommend this book to YA, adult fiction, and mystery lovers as it would please all readers. I thoroughly enjoyed the book and look forward to reading the next chapter in this story. I am really enjoying being a part of Hidden Gems. Of the dozen books I’ve read there have only been a couple I was vaguely disappointed in so far. If you are an avid reader and like writing reviews, you should really check it out. Yesterday was a shop till you drop day and I barely got any reading done. Today I devoured this book and think I just might plan a 24 Hour Read-A-Thon soon as I am still a bit behind in my reading goals for the year (crazy I know, but it’s an obsession). My husband and I are headed out to the movies tonight to see one of the many films we currently wish to see. We both got a movie pass and it makes going out to the movies much more affordable. If you are interested in reading about my other obsession, take a look at my other blog, My Fantastic Film Obsession, which I just started. Until next time, Good Night and Good Reading. This week has been a roller coaster. I am currently at home taking care of my 92 year old mother and this week was not a good one for her. We went to the doctor and got her fixed up, luckily what we thought might be a melanoma was just the results of a rash and she is on the way to healing. After weird weather going from bright and sunny to raining it looks like we are in for at least a week of good weather so my computer should not have the issues it gets during inclement weather. I live in a small mountain town about an hour out of San Diego and the one thing I hate about living here is the fact that we have no broadband coverage. There is a rumor we might be getting it soon, so please keep your fingers crossed for me. Enough about my wild week and on to what I read. If you knew the day you would die would it alter how you live your life? That is the question four siblings have to answer when they go to a gypsy in their youth who gives them the fateful news. The book follows the four as they enter their lives with the knowledge of their deaths. I liked the way the author told each siblings story and then intertwined them as the book moved along. This is an interesting question and I found myself wondering how I would handle the knowledge of my impending doom. In a story which could have been very morose, the author breathes life into each characters tragic story. While a little repetitive, I would still recommend this unusual tale. Jude was only seven when her parents were murdered and she and her sisters were taken to live in the world of Faerie. While happy there, Jude finds that being human in the Faerie world is not all it’s cracked up to be. When she is seventeen she wants to become a knight for the King and has to battle not only other challengers, but their common dislike for a mortal human. I am not usually a fantasy reader, but have heard nothing but good things about this title and decided to give it a try. Happily, I thoroughly enjoyed this tale of magic with a little romance mixed in. I think the thing I don’t like about fantasy is the myriad of characters in every story, this one was easy to follow and didn’t have me writing up notes to know who was who. I look forward to the next chapter in this series (The Wicked King). I have loved the Alice books since my childhood and read them many times, but when I saw the illustrations in this edition I simply had to have it in my collection. Garcia mixes the familiar story with macabre twists for a beautiful collection of art to accompany this ageless classic. The illustrations match the bent stories Carroll created and make this a great addition for any collector of Alice In Wonderland or illustrated books. This is the premise for this short tale of love and loss which takes place over a summer. While I enjoyed the author’s writing style, I had a problem with such a simple tale which is something almost every story has. I mean if you just had a hero and a villain where would the excitement be? I read the book in one sitting as it was pretty short and I think that is the way this one should be handled as it is pretty simple to figure out and if you gave yourself any time to think you might be let down. Only an OK read for me. Krissy and Vicky decide to open up a Bookstore/Coffee Shop in the small town of Pine Hills. Things are slow on opening day until the obnoxious Brendon Lawyer takes his coffee to go, forever. What follows is your basic cozy mystery with Krissy using her talent with puzzles to figure out who murdered Mr. Lawyer. First in the Bookstore Café Mystery series. Cozy Mysteries are my guilty pleasure as they are usually simple and very quick read. I enjoyed the characters and will probably return to this series; however, I found the romance part of the story to be a bit cliché and heavy handed. I hope the author finds his way to not make it clear that a male is writing this series as he had little finesse in showing how a woman falls in love. Seventeen year old Alice has spent most of her life on the road with her mother fleeing the bad luck which seems to always follow them. Alice’s grandmother wrote a book called The Hazel Wood which became a cult classic, but that is all Alice really knows about her. When her mom goes missing Alice must try to find her Grandmother and seek out the Hazel Wood in order to save both mom and her future. This book had so much potential, but became amazingly boring once it entered the fantasy of the Hazel Wood. I don’t know if it was the writing or the story, but I found myself having to reread pages in order to follow what was happening. Sorry, cannot recommend this one. Between weather, computer and mom issues this has been a crazy week for me. I have been reading and have many reviews to post. I will get on first thing tomorrow to get caught up. Until then, Good Night and Good Reading! I am having serious computer issues today. I think it’s the weather. I did finish a book, but I don’t want this to disappear as other work has and will post everything tomorrow when, hopefully, things are back to normal. Until tomorrow, Good Night and Good Reading!